I like cool gadgets. So it comes as now surprise that I would like to control my air conditioner with my phone. Plenty of units have this feature, they all come with a big disadvantage: A “must have” cloud connection. A big “No No” for me. I went on the hunt for an air conditioner thermostat that would allow me to directly WiFi connect to it. What most people don’t know: Almost all of those “smart” or “WiFi” enabled gadgets don’t even connect to your phone directly. They connect to some cloud somewhere – and your phone connects to that cloud as well. In other words – if you tap on your phone to change the temperature, you send this information to the cloud and the cloud sends it to your thermostat. Yes – the cloud knows (and most likely records) every tap. If your network goes down, if the cloud has a problem, if the cloud provider goes broke or doesn’t provide the service any more, all you have is an expensive and now pretty dumb thermostat hanging on the wall. Or worse: If the cloud provider gets hacked, some stupid a**hole can turn your house into a freezer or oven. Thanks. But no thanks. 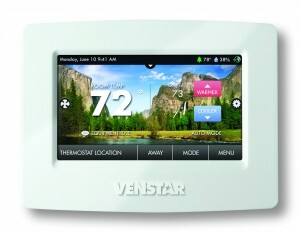 I finally found the “Venstar” line of thermostats. A more traditional unit compared to a “Nest” they also connect to a cloud – but that can be disabled. 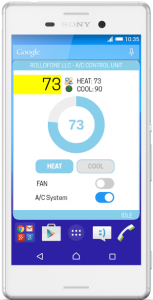 The units have an onboard API that allows to directly contact the thermostat and ask for information or set almost any mode or option. They have a dedicated developer site that makes it easy to get started with your own controller. I bought the T7900 model, installed it (it required the “C” wire) and started coding. The API accepts and provides JSON objects and it took very little time to have something up and running. I have a small dedicated server running in my house (it manages the security cameras, music streaming and more) which makes the communications to the thermostat and our cell phones connect to a web site on that server. Why no direct connection to the thermostat? Because it seems its inbuilt web-server gets startled if you fire API calls to rapidly. So far I can see all important settings, I can change the HEAT or COOL temperatures, switch between heating and cooling or turn the fan or the complete a/c unit off and on. Now – can I access my a/c when I am not home? In theory – yes. I could open the firewall to allow access to that home server. But it would provide not enough advantages to compensate for the risks of making that server available on the Internet. So – no – I don’t want to access the thermostat from remote. Question? Drop me a note. UPDATE: The unit supports HTTPS and username/password settings. Thankfully the technical support told me how to activate. It needed some changes in my software, but it’s now using secure transmission and authentication. Very .. very cool. Thanks for posting about this. I too am into home automation without a cloud service. I am sorry James. I must have overlooked the notification and didn’t accept your comment until now Well – seems the whole world is cloud-crazy so we no-so-cloudy people will have to come up with our own solutions. Thanks for commenting. Care to share your webapp for those of us techies that are more sysadmin types rather than dev types? I have been looking for a smart t-stat that doesn’t need the cloud for a while. Well .. sure. Though you still need a web server to present the GUI as the “app” is not a stand alone app but “web-” app – aka a web-page. But you can / should of course host it on your own web-server. We have a small linux box running in our house for that and other tasks. I have a rack with servers here next to me… I am sure I can spin up an extra VM to play with the interface. Do you have a Git repository or something? Hi., I know this is a quote old thread/comment, but I found it when searching for the same thing – a thermostat that would work with a local API. I’ve been using an RTCO one, but its networking reliability has gone to absolute garbage lately. I’d love to find one that had a direct Ethernet connection, but those seem to only be available on *expensive* commercial thermostats. So I’m looking at getting the same one you refer to in this post, hopefully its networking is a bit more stable. In any case, I am interested in the same thing that the poster going by “R” asked about – if you’d be willing to share your web-app (I assume it runs on apache?) – you answered that poster in the affirmative, but if you did actually share it, I don’t see where. I’ve included an email address below, and would be very appreciative of anything you’d be willing to share, so I might avoid rewriting the wheel. By the way, one secure way of accessing a web-app remotely would be to have something like an OpenVPN server setup (with appropriate port-forwarding in the router) that you could connect to from a client on your phone, that would then give you access to your home network just as if you were home. You’d want a dynamic DNS name setup to avoid having to manually check the IP each time. 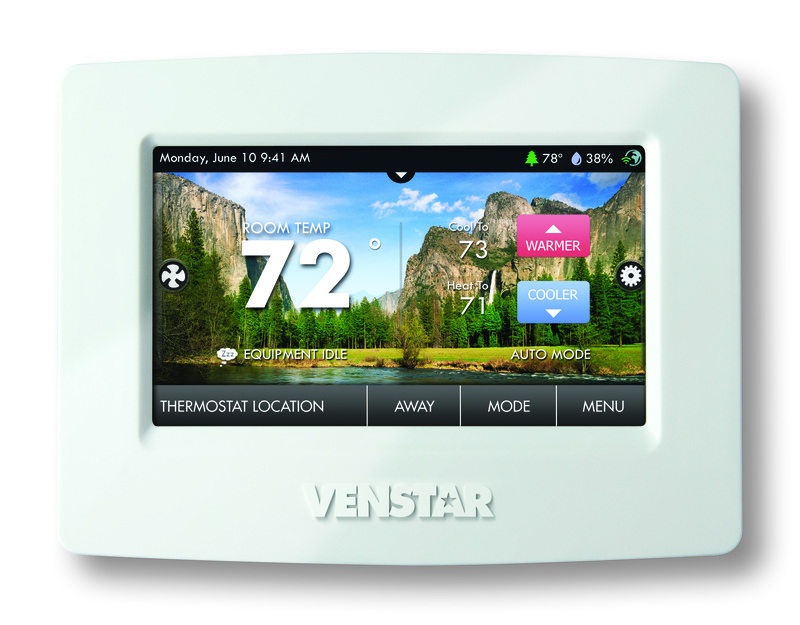 actually, the thermostat/API side isn’t the part I was primarily concerned with, I was mainly interested in the user interface side.. So unless you have a server running the web app it won’t do remote. backups and seldom leave it on because the disk is always churning.